Manchester City maintained their 11-point lead at the top of the Premier League and set a new division record for consecutive wins as they made light work of Swansea, running out 4-0 winners. Pep Guardiola shuffled his pack after the Manchester derby win against United on Sunday, naming Sergio Aguero and Bernardo Silva in the starting XI in place of Gabriel Jesus and Leroy Sane. Danilo replaced Kyle Walker and Eliaquim Mangala came into the side in place of Vincent Kompany. 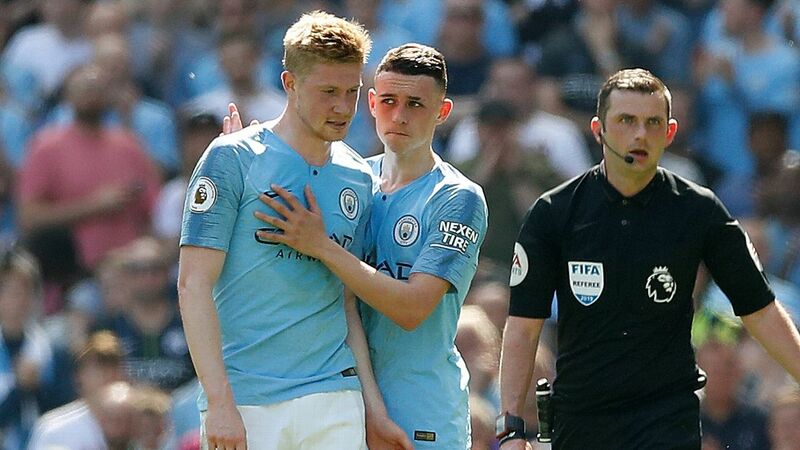 But it was barely evident as City brushed aside another opponent on their relentless march towards the Premier League title with David Silva scoring twice, either side of a stunning free kick from Kevin De Bruyne and Sergio Aguero adding a fourth late on. City have now scored 52 in the league already this season, while Swansea remain bottom of the table after an 11th defeat in 17 games. Romelu Lukaku scored for Manchester United as they attempted to keep up the pressure on City, running out 1-0 winners against Bournemouth at Old Trafford. Jose Mourinho also made four changes to the team that lost the derby to City, with Luke Shaw, Phil Jones, Scott McTominay and Juan Mata coming into the team for Marcos Rojo, Ashley Young, Ander Herrera and Marcus Rashford. That resulted in a disjointed display from United but they came away with the victory to remain City's most credible challenger. Lukaku's header came in the 25th minute, shortly after David De Gea had pulled off a superb save to deny Bournemouth's Charlie Daniels. Arsenal's problems on the road continued as they were held to a goalless draw by West Ham who had the chances to beat them. Jack Wilshere made his first Premier League start for Arsenal since May 2016, and Ainsley Maitland-Niles made his first start for the club. Meanwhile, Alexandre Lacazette was dropped to the bench with Olivier Giroud leading the attack. But Arsenal were unable to find the breakthrough against a dogged West Ham side invigorated by victory over Chelsea at the weekend. Alex Iwobi struck the frame of the goal for Arsenal, while Nacho Monreal cleared Marko Arnautovic's effort off the line after a rare error from Petr Cech and substitute Javier Hernandez hit the underside of the bar. Liverpool also wasted an opportunity to stay in touch with the clubs at the top of the table as they were held to a frustrating goalless draw by West Brom. Jurgen Klopp rang the changes again with Philippe Coutinho, Mohamed Salah, Sadio Mane and Roberto Firmino all starting and Loris Karius preferred to Simon Mignolet in goal. But despite that they failed to get going at Anfield and looked a shadow of the team that scored seven goals in the Champions League a week earlier. In the second-half Liverpool saw young striker Dominic Solanke have a goal ruled out and were given a scare as Hal Robson-Kanu struck the crossbar with a long-range effort. Tottenham saw off Brighton to win 2-0 at Wembley and win a second consecutive game, but they made hard work of it. Dele Alli was named on the bench for Tottenham with Erik Lamela making his first start in almost 14 months. Serge Aurier scored his first Tottenham goal to put Mauricio Pochettino's side ahead five minutes before half-time. The former PSG man opened his account for the club in bizarre fashion, his cross evading everyone in the box and going in. Spurs added a second and made the points safe in the closing stages as Son Heung-Min scored from Christian Eriksen's free kick. Sam Allardyce continued his unbeaten start as Everton manager with a 1-0 win against struggling Newcastle. Since taking over Allardyce has overseen four wins and a draw in all competitions and this latest victory lifts Everton into the top half of the table and eight points above the bottom three. Wayne Rooney put Everton ahead in the 27th minute after Newcastle goalkeeper Karl Darlow failed to hold on to Aaron Lennon's header. Jonjo Shelvey was sent off in added time, reducing Newcastle to 10 men. That was a seventh defeat in eight games for Rafa Benitez's team who have failed to win in that run and were booed off. Claude Puel enjoyed a happy return to his former club as Leicester ran out comfortable 4-1 winners against Southampton. Leicester made a quick start with Riyad Mahrez, Shinji Okazaki and Andy King putting them 3-0 ahead at the break. Maya Yoshida pulled one back for Southampton on 61 minutes but Okazaki scored a fourth for the visitors soon after to restore their three-goal cushion. Leicester have now won four consecutive games in the Premier League and move up the table.